The NBA playoffs are here and it's time to consider how seriously teams and their superstars can be taken. 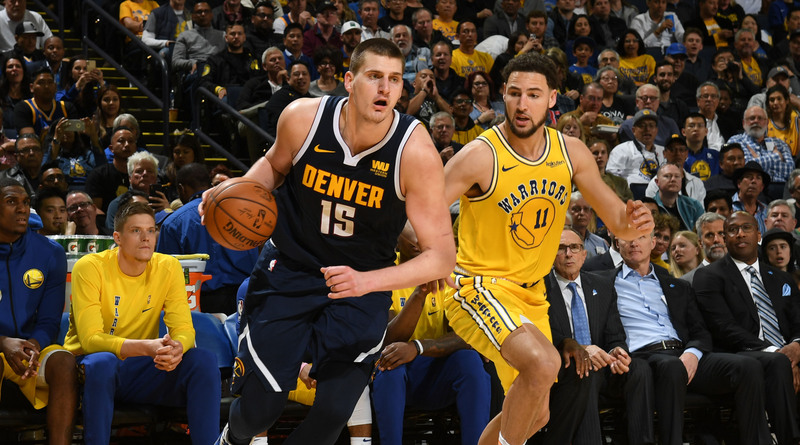 Andrew Sharp and The Washington Post's Ben Golliver took to the Open Floor podcast to have that conversation about Nikola Jokic and the Nuggets, considering his strengths and weaknesses and Denver's place in the NBA. What they came away with was a bit of a mixed bag, as Jokic is a clear star with clear flaws and the Nuggets are a talented young team with an unclear future. Ben Golliver: I'm going to read you something that Tim Connelly told me. People can check this out on The Washington Post, and I want your live reaction to it because it hit me when he said this, ok? He said, "It's a lazy narrative to denigrate what Jokic has done and not see how it translates to the playoffs. I question how many of these critics have watched a whole game. He's a prime example of being judged aesthetically. He doesn't look like a superstar and doesn't play above the rim, but his game is playoff ready. He can post up, hit threes, play from the elbow, handle the ball in pick and roll, finish off pick and rolls. He's the best passer in our league regardless of position, he's always rebounded. Those things are important in playoff basketball." I was like, "OK, Tim, drop the mic." Andrew Sharp: I also didn't hear defense in that quote. Golliver: I really hear what you're saying, but at the same time I'm getting visions of the stumps on skates. That's always right there, kind of weighing over everything. So you sound a little bit skeptical not only of the Nuggets but maybe a little bit skeptical of Jokic too. Did that passionate plea on behalf of his GM, who obvious is a biased narrator here but he's also an informed narrator, did that convince you at all. Sharp: I didn't need to be convinced on the Jokic front, and I'm not really skeptical. When I say would I compare Jokic to Dirk, all I'm saying is Dirk benefited in that the things he was amazing at were also exactly what became really, really important over the second half of his career, and he was well-positioned to benefit. The things that Jokic struggles with are weaknesses that are easily exploited as the game becomes more spread out, and that's something that I worry about when we're talking about if he can win a title. Can you win a title with him as your best player if you're building a defense around him? We'll have to wait and see. As far as the Nuggets and the first round, the thing I'm worried about is Jamal Murray. I don't trust Jamal Murray whatsoever. Gary Harris has been really up and down. Their wings aren't good enough, their guards are young, and so that's the part where I'm willing to take a leap of faith and say that Jokic can go into a playoff series and be the best player on the floor. But there are other questions in Denver that kind of tip the scales for me where I'm like, "I don't know if I trust this team." Golliver: I hear you completely. I guess my point would be they're not playing that good of a team. San Antonio was good this year, not great. So if Jokic is the best player in that series and they have homecourt advantage, shouldn't they sneak out that series win? So I'm actually picking the Nuggets in seven in that one. I'm not doing so confidently. I share a lot of your hesitations and your concerns. They definitely backed their way into the two seed, almost in historic fashion the way they've been playing here lately. Everything just broke perfectly for them. I think they would get swept by Golden State if it's the Western Conference finals. I don't think they have the perimeter size, length, athleticism, switchability to keep up with the Warriors at all. I think it actually would get really ugly. I think it would be like an average of 15 to 20 point wins. Sort of like how Golden State rocked Utah a couple years ago. But they may never get to that stage for us to find out. Sharp: We'll see, and the other thing that could work in Jokic's favor is that with Golden State we're talking about the greatest smallball team of all-time. All the pieces fit and they have three of the best shooters we've ever seen in the NBA over the last 80 years, and once that team breaks up it may not seem as impossible for big guys to stay out there on the court and thrive in the playoff environments. Golliver: That was a great point. You should be really proud of that point. Excellent point. Sharp: I've thought about that with Embiid and another few guys. Let's wait and see where we are in another two years.